The Silverado's diesel engine -- the first in a full-size Chevy pickup since the late 1990s -- and 6.2-litre V-8 will be mated to a 10-speed automatic transmission. 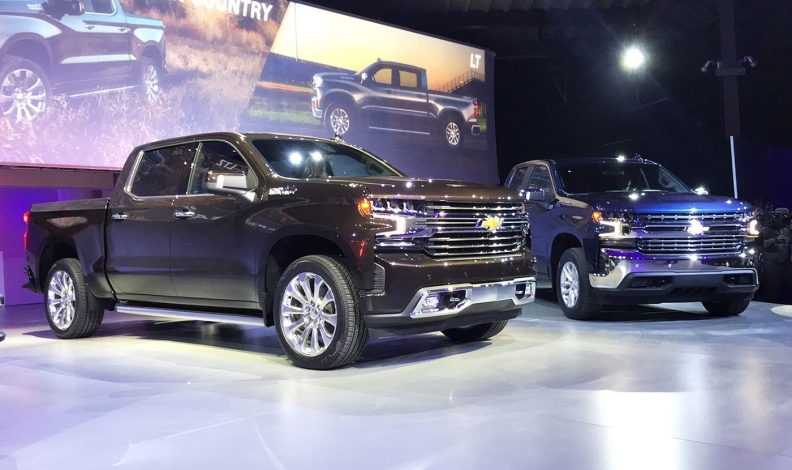 DETROIT -- Industry-first engine technology, significant weight savings and a new inline-six diesel offering are among the enhancements General Motors is counting on to boost Chevrolet Silverado sales in Canada and bolster its position as the second-best-selling vehicle in America. The redesigned 2019 model, shown Saturday evening ahead of the Detroit auto show, is larger than current models yet as much as 205 kilograms (450 pounds) lighter. It features a longer wheelbase, more interior space and a new high-strength steel bed with increased cargo volume and an available power up-down tailgate that can be operated from the key fob, an interior button or by hand. 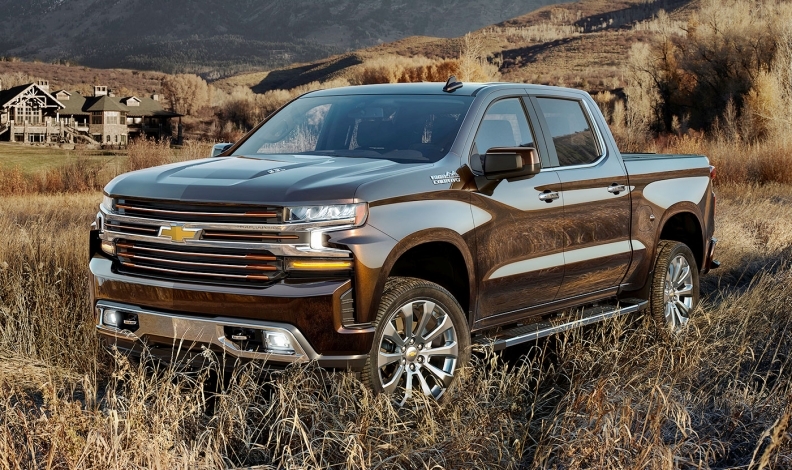 The enhancements and weight reduction could help the 2019 Silverado stake a claim as the most efficient full-size pickup in the market when it arrives in dealer showrooms in fall. GM product boss Mark Reuss called the redesign a “massive undertaking” that resulted in a “very responsive” truck that’s larger, lighter and more durable than ever before. 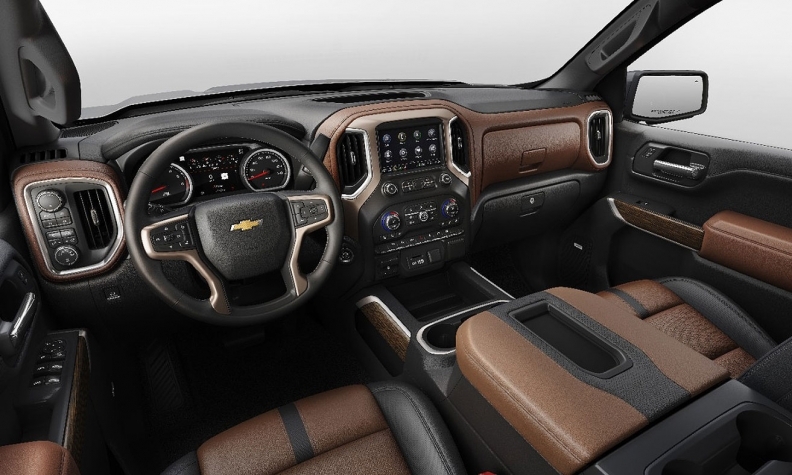 “We are confident that the Silverado will be the very best truck for every customer,” he said Saturday following the unveiling of the trucks here. GM will offer six powertrain combinations, including a 3.0-litre inline-six diesel and 5.3- and 6.2-litre V-8s with a technology called Dynamic Fuel Management that can shut off cylinders, in a variety of combinations, to optimize performance and fuel economy. It's expected to increase efficiency by as much as 21 per cent, though GM didn't give details. The diesel engine -- the first in a full-size Chevy pickup since the late 1990s -- and 6.2-litre V-8 will be mated to a 10-speed automatic transmission. GM didn't provide details of other transmission pairings or engines. Chevy currently offers a 4.3-litre V-6 as its base engine. The redesigned pickup will have six engine options. The base engine, Reuss said, could “quite possibly” be a new offering. He declined to comment on whether it will be a four-cylinder engine. On the diesel, he said: "I am really confident that we will have the best-performing diesel in the segment." Ford Motor Co. earlier this week announced that it expects its first diesel F-150, which goes on sale this year, to achieve a highway fuel economy rating of 12.75 litres per 100 kilometres (30 mpg). The eight trim levels include two new Z71 Trailboss models and an RST, for Rally Sport Truck, trim. The models will be much more distinctive than the Silverado's current offerings, said Sandor Piszar, Chevrolet truck marketing director. "We wanted to make it easier for consumers and dealers to find the right truck for what they're looking for, and we've further refined that notion," he told Automotive News, adding that consumers and dealers can expect a "similar price walk" to the current pickups. Pricing, fuel economy and other details have yet to be announced. 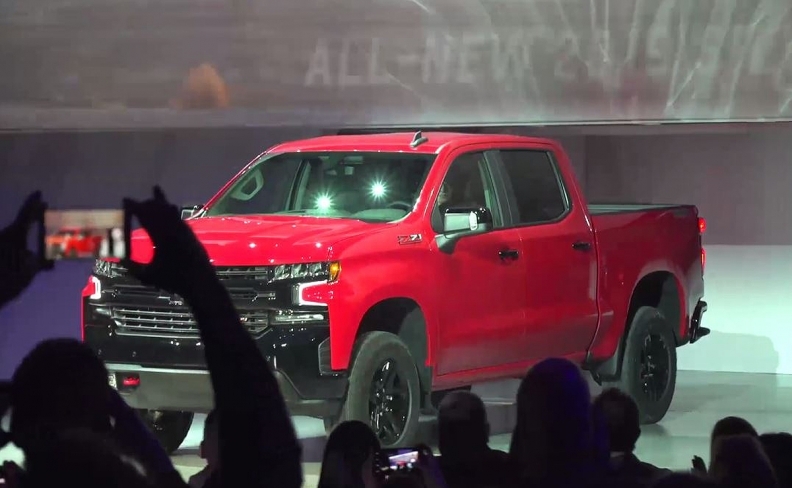 During Saturday's event, GM product boss Mark Reuss called the redesign a “massive undertaking” that resulted in a “very responsive” truck that’s larger, lighter and more durable than ever before. “We are confident that the Silverado will be the very best truck for every customer,” he said. And, on the diesel, he added: "I am really confident that we will have the best-performing diesel in the segment." Production of the Silverado and the forthcoming redesigned GMC Sierra is expected to start at GM's plant in Fort Wayne, Ind., in the fall. GM also builds the trucks in Mexico. Reuss said the Fort Wayne plant will add production of the crew-cab models, which have been built only in Mexico. Meanwhile, GM’s Oshawa, Ont., plant will finish assembling and paint outgoing 2018 models shipped to Oshawa from Fort Wayne, Ind., for the foreseeable future. “Oshawa will be building current model (K2) pickups that helps us meet customer demand while we are in transition to next-generation (T1) pickups,” GM Canada spokeswoman Jennifer Wright previously wrote in an email to Automotive News Canada. “This strategy will help us meet customer demand as we transition our production and introduce our exciting new models into the market starting later in 2018. GM reportedly spent nearly $3.74 billion (US$3 billion) on updating its factories for its next-generation trucks in ways that allowed for streamlined manufacturing, fewer parts and lighter trucks. "This is a ground-up, all-new way of looking at a pickup from manufacturing, from design, from everything," said Tim Herrick, executive chief engineer of full-size trucks. "Every model got some level of weight savings, up to 450 pounds." Much of the weight savings came from the pickup's frame and body. All exterior swing panels (doors, hood and tailgate) are made of aluminum, while fixed panels (fenders, roof and bed) are made of steel. Eighty percent of the frame is made of high-strength steel, two to five millimetres thick. The Silverado and Sierra, according to Reuss, will arrive in showrooms at the same time later this year. He said GM plans to unveil the Sierra toward the end of the first quarter or the beginning of the second quarter. GM hasn’t unveiled the pickups separately since the first-generation Silverado debuted as part of a rodeo-themed news conference in 1998.